Businesses usually require paperwork for anything but the smallest company purchases. A blanket purchase order cuts down the paperwork. Instead of, say, three dozen purchase orders for printer paper over the coming year, the company uses one blanket purchase agreement to order a year's worth of paper. This saves money and time, but it doesn't work for every purchase. Businesses use blanket purchase orders when they need a constant supply of a standardized product. With one blanket PO, a company can buy a year's worth of supplies at once. The vendor delivers throughout the year whenever the company asks. A blanket purchase order has some of the advantages of buying in bulk. 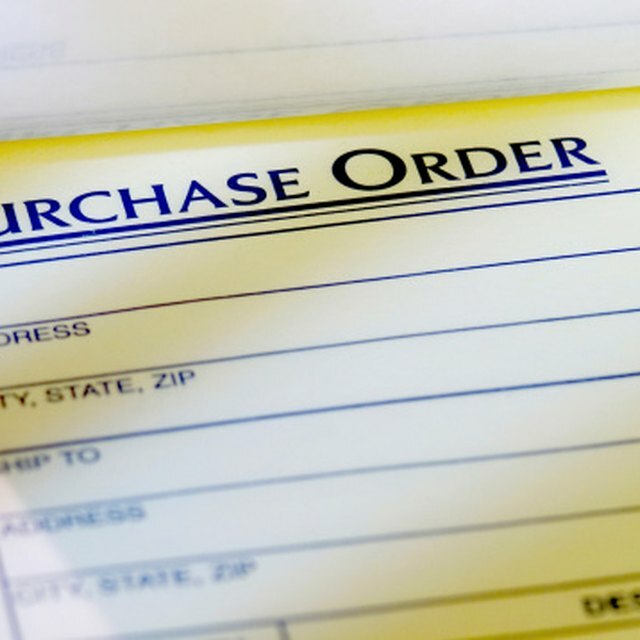 Because there's only one purchase order, it saves staff from having to write multiple purchase orders for the same thing over and over. By replacing multiple small purchases with one large purchase, the company can qualify for bulk discounts, but unlike a bulk purchase, the company doesn't have to receive and store the entire quantity. Instead, buyers simply call the vendor when they need to restock. A blanket PO is a more flexible version of a standing order. Companies use standing orders when they need regular deliveries of specific quantities. For example, a manufacturer that uses 50 gallons of acid every week can set up a standing order: Every Monday morning the acid vendor delivers that week's acid supply. If the company needs the same amount, but on a more variable schedule, it would probably use a blanket order. That way the vendor doesn't deliver the acid until the company requests it. Blanket and standing orders both allow a business to save time and often money. There's no need to negotiate prices with each shipment or to search for a new supplier because the purchase order locks all that in. Am I Required to Get a New W9 From a Vendor Each Year? A blanket purchase order is a good choice if your company makes lots of repetitive purchases or provides a standardized product or service. If you can obtain a quantity discount by going blanket, it's an even better deal. A blanket PO is a poor choice if you don't have a firm price for the purchase or if the price is subject to change without notice. It's risky if you aren't sure the product or service is good enough quality to meet your needs. In those situations, it's often safer to stick with multiple purchase orders until you find a reliable vendor. The blanket purchase order should set the prices, quantities, terms and billing conditions. It should spell out how long the agreement lasts and include a cancellation clause. Even after you implement the agreement, monitor your purchases. If your company ends up ordering more than the agreement covers, you won't get the guaranteed price on the extra goods.